Reading is THINKing! 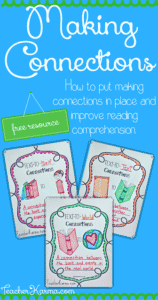 Foolproof reading comprehension strategies for helping your students be better readers. 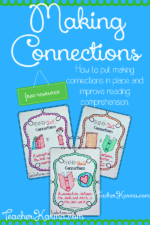 You will love these reading strategies and anchor charts to help you get ready for Back to School. At one time, I honestly believed that if I only presented my students with a perfectly planned, amazing reading comprehension lesson, then they would be able to absorb everything like perfect little sponges. Boy, have I learned a lot about how to teach reading comprehension! It took me just a while in the classroom to realize that students have changed a lot since I was a an elementary student myself! THINK WHILE THEY ARE READING….?? You may want to use the anchor chart below, Reading is Thinking, to introduce the overall concept of metacognition and how to actively think while reading. Next, Explain to your students that they will be learning each of these reading strategies and using them everyday to be better readers. Explicitly explain to your students that over the next few weeks, you will be modeling how to think, ask questions, predict, summarize, visualize, infer, and make connections while reading. Be as purposeful as you can about using appropriate academic vocabulary. If you are not using words like metacognition and visualize with your students, start today! Start yesterday! Teaching our kiddos how to actively participate in their own learning is difficult, but it will be so worth it in the end. Once your students realize that taking the time to think at the same time as they are reading is making a difference, they will move forward. You will begin to real see progress. Give your students time to practice. Give them more time to practice reading and thinking, and when you feel like they have got it all down, give them some MORE TIME to practice the strategies. PRACTICE, PRACTICE, PRACTICE is the key here! share their thinking aloud with another student. This is especially important for your struggling and ELL students. Provide your students with an opportunity to share what they are thinking by pairing them up with a buddy. After they share aloud, they can then begin to get their thoughts down on paper. You will notice more meaningful responses. 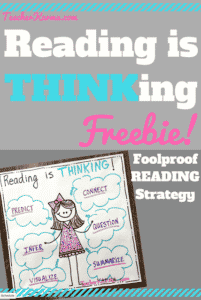 Click here to get your own Reading is Thinking FREEBIE. Reading Really is THINKing! Perfect for Back to School. Teacher Karma Blog :) I have taught first grade, second grade, third grade, fourth grade, sixth grade, RTI / intervention, and coached students and teachers as a Literacy Coach. To add to the list, I am currently consulting with school districts to help them develop their Response to Intervention / RTI programs. So glad you stopped by. Grab some Classroom Freebies and ENJOY!